April is National Garden Month, and there’s no better way to enjoy fresh vegetables, fruits and herbs in season than with your own garden. Small space? No problem! 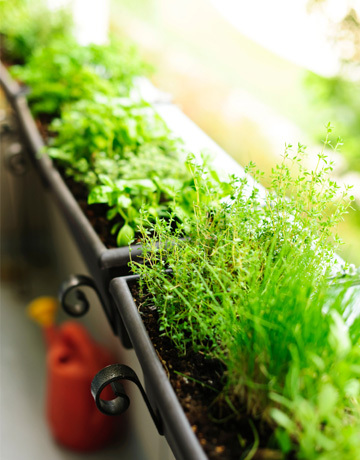 A window-box garden or three-pot herb garden is a suitable choice at an affordable price. It’s easy to do it yourself if you follow these simple suggestions! Gardening guru Chris McLaughlin teaches readers how to maximize the smallest spaces, like a windowsill, balcony or even a fire escape and turn bare soil into lush greenery in her latest book, The Complete Idiot’s Guide to Small Space Gardening. You’ll find most window boxes are made of traditional materials such as wood, iron, cement or terra cotta. But plastic window boxes are becoming increasingly popular because they retain moisture and they’re lighter. Lighter not only means cheaper, but it also means they’re lighter even after they’re planted. You don’t have to plant a huge garden, just the herbs you use the most. Favorites include basil, parsley, oregano and rosemary. Seeds or seedlings? Seed packets are definitely the most economical way to go. You can purchase them at Wal-greens and other stores, often for less than $1 per pack, and you can get many plants from one packet. Although small plants ready for transplanting do cost more to purchase, the herbs will be ready to harvest sooner. Egg cartons make great starter trays for planting your seeds. Simply cut the top off and punch small drainage holes in each “egg” section. Fill with a good quality, fast-draining potting soil, then sow your seeds according to package directions. Use the top of the egg carton as a drip pan by placing it underneath. Once plants have two to four leaves on them, they should be transplanted into larger containers. Another great perk that goes along with growing your own herbs is that you can dry them for future use. It’s much more cost-effective than buying them at the store. Once your plants go to seed or a little before, cut the stalk and let them hang to dry in a cool, dark place. Save the seeds from the basil plants by leaving a tray underneath them while they hang to catch the seeds when they fall. You then just plant the seeds from the previous year! How’s that for cheap? Plant perennial herbs such as rosemary, oregano, thyme, mint, sage, lavender or chives, and you can receive the benefits for years to come. These plants are easy to care for, extremely durable and can survive several transplants, if they outgrow their containers. Check your climate and agricultural zone to see if all these plants will return as perennials. Sage, basil, chives, lavender, oregano and rosemary need full sun, while mint and thyme can tolerate light shade. Use a good quality, slow-release fertilizer, like Miracle-Gro Organic Choice. Also, because soil in pots dries out quickly, you may need to water daily, especially when it’s hot. Snip away! Herbs thrive from constant harvesting. This helps keep them healthy and not too “leggy” — so you get more of the delicious leaves, and not so much of the stem. Again, the Krazy Koupon Ladies show us that growing your own fruits and veggies means lower grocery costs and fewer trips to the store. Unfortunately, all those great savings ends when summer comes to a close, but there is one vegetable you can grow all year long, regardless of your climate, space constraints or green thumb: green onions. Green onions grow fast, and all they need is a little water and a lot of light. 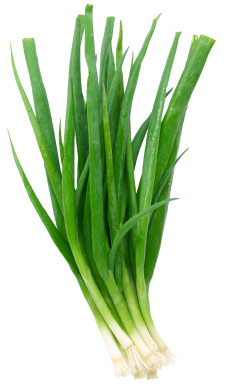 With very little effort, you can have a steady supply of green onions, grown right in a sunny window in your kitchen! The next time you pick up a bunch or two of green onions at the grocery store, don’t discard the white ends after you’ve used up all the greens. Instead, stick the white root end into a glass with an inch or two of water, then place it in a sunny window. Make sure to trim most of the green end off before you place it in the water, or they’ll just get droopy. Within a day or two, you’ll notice the green shoots starting to regrow, and the roots in the water getting longer. In less than a week, they’ll be back to their original size, and you can just trim off as much as you need, whenever you need it. In fact, the onions grow so fast you might find yourself trimming them back even when you don’t need any, just because they’ve gotten so tall!